To make sure you get the best deal we'll show you great prices from all of our drivers, including Alphonse D Removals, if they're available on the day of your move. Have a question for Alphonse D Removals? No problem, send them a message and they'll email you back as soon as possible. If you have a more general question you might find it answered in the FAQ, or you always contact one of our brilliant customer service team. * Alphonse D Removals won't be able to see your email address. Very helpful and courteous! Thank you! Despite a mix-up with timings my driver Alfonse was amazing and helpful and made me feel at ease on the long drive down to Brighton. Would definitely use the service again, thanks! Not the drivers fault for the delay, we are in Brixton and we called for the van during rush hour. He was fantastic. Very friendly, knew exactly how to quickly load up the van, and helped us unload to our new house. I rode in the van as a passenger and had a lovely chat. Great customer service and very professional! I have to thank the friendly driver for being helpful and considerate to help all the way to my door. Once again a superb service from Compare the man and Van. Thank you. We had to pickup stuff from 3 locations and Alphonse was really helpful! Nice man. Helpful. Massive van. Unfortunately was 45mins late due to traffic but was very apologetic and luckily we weren’t on a tight deadline. Would recommend. He was a nice guy. I selected for the driver not to help us move our things but he offered to help give us a hand anyway. A very calm and non stressful move! There were blankets in the back of the van but no straps. Overall, a very good experience with this guy! Alphonse was extremely helpful. He made sure every item I was moving from my home was kept safe and secure. Very friendly & i would definitely recommend him. He did lots of extra bits with the move that he didn’t have too! Thank you! Alphonse was brilliant and helped in every way he could. Can’t fault the service. Lovely driver, helped so much and seemed to genuinely enjoy his job. Would definitely use again! Thanks so much! 1) straps & blankets were available but not used. 2) on the whole respectful to our items but allowed the end of the mattress out of the mattress protector, meaning the mattress got dirty. 3) Back corner of the van already occupied, meaning we had to do a separate car trip to transport the rest of our stuff. Alphonse contacted me to say he would be arriving a bit later than scheduled but that was great for me! He is a great driver and stayed in great spirits even though we got heavily delayed and diverted due to an accident on M4! I enjoyed my conversation with him and it kept me sane on the day of the move! Nice enough guy, van a bit old but fine. Worked really hard to help move our stuff. Would use again. Alphonse could not have been lovelier! He was positive and chatty throughout the experience, made jokes when I was stressed, and helped even though he was not required to. He had his own Allen keys when our set did not fit the bed, and was able to park the van on a very narrow road. We could not recommend him more, and have taken note of his number for any other jobs we need doing. an easy moving experience. I'd hire him again. Driver was just 10 minutes late due to traffic, but was really helpful at moving a lot of furniture and boxes. Everything was packed carefully and the drive was extremely smooth. Would definitely recommend. Alphonse was a pleasure, great company during a stressful time. Thank you! Fantastic service from Compare the Man & Van and our driver who was super polite and helpful! The driver was very helpful and very good value. I moved with no issues. Would recommend! Very nice guy and made the move very simple. My apartment complex even accidentally allowed another person to take his trolley but he was very patient and professional about it. Excellent driver, brilliant experience! will recommend to my friends. He was very prompt, welcoming and helpful. Would strongly recommend! Very very helpful and friendly! Friendly, helpful, and I would highly recommend him to anyone! I was very impressed as one of the addresses he had to go to was very difficult to find but he seemed to manage it without any problem. Really amazing and great driver! Will definitely recommend! Was over an hour late due to traffic but was very helpful when he got to us. Managed to move everything in quick time and all went very smoothly. Would recommend! Great service and a friendly guy, would highly recommend for short and long trips. to have my things safely in my new place In good time. I could not have asked for a smoother moving experience. The driver was excellent! Alphonse was amazing and went out of his way to help us. He really made our move easier. Roger was really pleasant and helpful. It was a very hot day with lots of stairs, and we couldn't park as close as I would have liked, but he had everything loaded and delivered up to my flat quickly and efficiently. Fully recommend. Fantastic service, on time, helpful, great communication and very friendly. Even gave me a lift back to my flat after putting stuff into a storage facility. Would highly recommend. Driver was nice, however I booked for midday and the day before delivery the driver asked to change to 10am - which I agreed to - but then he didn't arrive until 11:30. Sounds like the previous delivery he had messed him about but it was frustrating as i had changed my plans to accommodate the new pick up time. Very prompt, great communication and helpful packing. Would recommend! Driver was excellent. We finished under time. I had an error in terms of the address on the online booking, and he was happy to correct it free of charge. Hello there, the move was excellent. The driver couldn't be more polite and helpful and I would not hesitate to recommend your Company. Many thanks. 100% satisfied. Our driver was over an hour late. We were moving house and therefore had an incredibly busy day lined up to move a lot of stuff. My partner was sat waiting at our storage unit for a full hour and the excuse we were given was ‘there was traffic’. My partner had even looked at online traffic maps to see if this was the case, it wasn’t so it was clearly a lie. I’m pretty disappointed in the tone management of the driver, especially on a day when we had so much going on. Alfonso was very helpful. He got the job done in the three hours I had booked him for and the main reason for this is, that he got stuck right in! He handled items with care and was not shy of taking charge of the heavier items. To add to all of this he was friendly and chatty. Alfonso had blankets and a trolley to support heavy or fragile items but unfortunately he did not have furniture removal straps. But aside from that he was a great help and my move turned out to be a lot smoother than it would have been because of his help. Keep up the good work. I think I want source driver in the future if not the same. Very good service. Polite, friendly and helpful. Would recommend. The driver had a friendly, nice, positive attitude and was indeed helpful. However, I was not expecting the £11.50 charge due to the "congestion fee" he insisted I had to pay at the end of the move, which I found quite unfair as it was completely not foreseen. In case this charge was not needed, I would like to be refunded if it is possible. We do put clear warnings on the website prior to booking, and in the email confirmation you receive, that we are unable to include the congestion zone charge in the quote we provide. Unfortunately, as your collection address was in the zone, the £11.50 charge was legitimate and paid by the driver to TFL on your behalf. Alphonse was late due to a previous job overrunning, but when he arrived he was helpful and courteous and did the job for us very well. I would recommend him. Alphonse was incredibly helpful and I would certainly recommend him as reliable Man and Van service. He didnt hesitate to take the heaviest boxes over 4 flights of stairs. Overall experience of otherwise stressful moving was hassle free owing to Alphonse's help. Alphonse was friendly, courteous, careful of the furniture and packing up. Alphonse, my driver, was fantastic! Unfortunately that day, I didn't have enough money to give him a tip. I would very much like to. Can you let me know how to do this. Thanks. Great service, very friendly driver, even helped carry items although we hadn't requested it, highly recommended. First time we've used this website, would definitely do so again. The driver (Alphonse) was extremely slow, and would systematically go for the light objects and boxes, leaving us to do the heavy loading. He wasn’t efficient or proactive. I got the feeling he was trying to slow us down so we’d have to pay extra. Then once we finished he revealed all these extra charges no-one had told us about (extra £5 for each mile over 1 mile!?! ), so in the end we payed around £60. Would NOT recommend him at that price. I would like to respond to this review. - £10 for the 45 minutes that the booking ran over the booked time. I feel the above was fair and is in line with my advertised pricing. He was great, very helpful and would definitely recommend! Although Alphonse was late he called well in advance to let me know. He was efficient and very good at managing my fragile items. He was great company in the ride and worked fast to get everything packed and unpacked, I would definitely use his services again. Very efficient, very fast. Overall, best one I ever had. The driver was very accommodating (he managed to fit me in on Saturday when I’d originally booked for Sunday but this wouldn’t have been possible due to the marathon). He was very friendly and arrived promptly. Thanks! The driver did a great job! Very nice driver! Wonderful person! Thank you very much! Alphonse is an easy going lad and is really careful and fast in what he does. Excellent experience throughout, Alphonse is the nicest guy and he was professional and helpful. everything i had in minutes which would have taken me an hour. He was very quick but careful that none of my things get ruined. He was a bit late but called me before and explained. We were then also stuck in traffic for almost an hour! But we had a very nice conversation and he even offered me a snack. I felt bad for him because he then working on my move was late for another appointment and the next customer just shouted at him and threatened to cancel, although it was completely out of his control to be stuck in traffic. I gave him a bit of a tip after and he even offered a discount if i ever need him again! Overall I am very pleased with my move and Alphonse! If i move again I will definitely call him as his service was very very good! Great driver. Even helped me put the item back together which wasn't expected! Alfondso was excellent. No complaints! Very polite, efficient, and ensured my belongings were moved safely. Would recommend! Was friendly and quick with getting us moved in. Excellent service ! Alphonse was absolutely amazing. He was kind, fun to talk to on the drive, and had no problems getting involved; helping out with the heavy lifting. Our move went so smoothly, and that was entirely down to him. I’m genuinely grateful for his help, and you could not find a nicer driver than him. 11/10 all round. Driver called me 1 hour before to let me know that he was going to be late due to traffic. My question is, where was he coming from to know so long in advance that he would be late? He told me I was the only customer he had for the day. I guess he didn't plan the journey very well so I ended up delaying my moving 30 minutes. I had to go pick him up a couple of streets away from mine to show him the way. He couldn't understand me over the phone and I believe he didn't get the right address. The van was beyond dirty. I almost called a taxi so I wouldn't have to sit in that van. The driver was nice though. Big thanks to the driver who was most helpful on the day. Would recommend. Great guy who was very friendly and took care over everything, would recommend to anyone. Helped us unload and was an alround nice guy. Nice, friendly driver, good service. Great move. Very helpful driver. Would definitely recommend him. He was absolutely fantastic and helped move a huge sofa up 7 flights of stairs. Everything went smoothly. The driver helped me carry the luggage. Very helpful and friendly. Went above and beyond. Would use and recommend again!!! Made our move easy and stress free, highly highly recommended. Great Service, very polite and well mannered. Efficient from start to finish. He's been very polite and helpful. The van was sufficiently large and as advertised. Recommend him. Driver was very friendly, helpful and great to chat to! Amazing service. We had an issue with our sofa having to go trough the window and Alfons stayed and help remove a window and fed it through. Massive help and did so without even having to ask. The driver turned up over an hour late, fair enough not his fault with traffic/accident etc, however the first thing he says is 'No Rush, No Rush'! I had paid for his help loading and unloading - I wouldn't bother as his help was negligible and felt like he was trying to take his time so he would get more money even though it also made him later than ever for his next appointment. I am sorry that I was late to this booking, the delay was due to an accident on the A2 although I did call the customer to make her aware of this. I feel that I fully assisted with this booking and would obviously not have wanted to delay it further because of the knock-on effect of this delay to my next booking. Alphonse was great, he was running late due to traffic but kept us fully informed. Would totally recommend. Just excellent, above and beyond. Alphonse is super helpful and friendly too. Would highly recommend. Alphonse was super helpful and friendly too, moved all our things with great efficiency. Would highly recommend. Lovely man and really helpful! Everything g went smoothly & on time. My driver was friendly & very helpful. Very happy customer ???? Alphonse was bang on time, helpful, had a huge van, and was very careful in moving the items. Recommended! Great driver! On time and was willing to help with everything - made my move very stress free! I would highly recommend this driver! Really helpful and friendly guy. Thanks a lot. The driver was helpful beyond ordinary duty, and maintained a light athmosphere. Even though our driver was 10 minutes late this did not matter and he was very efficient, fast, careful with our belongings, chatty and helpful. Would definitely recommend! Although the driver was not on time, I was informed every step of the way, of how far away he was and the reason why he was late. A nice and friendly driver and a lovely smooth ride. Cannot say if it came with blankets or straps, it was not needed on my journey. Good lad, was patient and helpful, recommended. Excellent service and a lovely guy! Excellent service! Very punctual & pleasant. I highly recommend Alphonse. Alphonso was very professional, respectful and pleasant driver. Good service and nice talks during the journey. Highly recommended! Alphonse made a stressful life experience of moving care free! Glad I chose him. Did a great job for me. Such a great guy! Helped us with our stuff up and down stairs, on time, and drove very carefully once we were loaded up. Recommended! Alphonse was great, really helpful and a pleasure to drive through London with. Would definitely recommend, and likely to use again. Went above what was expected, and made our move so much smoother. Alphonso was a very helpful, friendly and charming chap. Would strongly recommend him. Alphonse was great! He is helpful and honest. I completely understand and am glad he informed me early on to adjust the pick up time. CMV response: We do have a 2 hour minimum booking time which is clearly displayed prior to booking. This is an industry standard and is not hidden at any point. Alphonso was Absolutely excellent, highly recommended! He's so lovely and really helpful! Will always use him in future!! Very friendly and helpful driver. Also called to let me know he will half an hour late. alphonse was very considerate and caring about my goods , he drove very cautiously to protect my boxes of Porcelain lamps! !Thank you alphonse! Great service. Lovely guy. Would definitely use again..
Lovely chaps, very hardworking and polite - also charmed the socks off my mother-in-law who got to practice her french with them. Highly recommended and I would definitely use them again. Top driver. Came early, was really helpful and hard working, carried a lot of items quickly and had an interesting chat along the way. Definitely recommend Alfonso! Bad traffic meant he was delayed. Driver was really helpful and patient. Nice chap, called in advance. Would recommend highly. Driver was a good honest man, although arrived late he kept me informed every 15 mins on progress. I travelled with him, he was polite, sociable and very pleasant. I would have no issues recommending this driver to others and will certainly use him again. Driver was about 40 minutes late, but called before and informed about the traffic situation. Over all, he is a nice guy with a helpful attitude, which I'd recommend to work with. He came at very short notice was polite and helpful! Friendly service and very!helpful! He was late because of bad London traffic but kept us updated all the way. He was helpful and thoughtful! Extremely helpful and very friendly, exactly what you need when moving is stressful in itself - we used his expertise to inform which size storage we needed and was great. Would highly reccomend!! Nice and friendly - really helpful! Driver was so helpful and really friendly! Very positive experience!!! Thanks!!! He deserves 1,000 stars, he was incredible. Even though we'd only paid for the driving he helped us move try to get our sofa into the flat, when that didn't work he leant us his tools so we could take it apart and bring it in. Very friendly and full of positivity (moving is stressful). You need this guy! He was great. Helped us with our luggage. I had to change my move to be earlier 2 days before, and he was so lovely about it! Really friendly and chatty and so helpful. He even arrived early. Alphonse is brilliant. He both friendly and professional, took good care of our stuff and was efficient. Def recomment him! Excellent service and very friendly. Highly recomended! A most excellent fellow! I doubt there's a better one... I recommend him highly to all. Moving is a difficult experience but this chap made it almost a pleasure! Best wishes to him. Great service, on time, helpful and felt very comfortable that my belongings were in safe hands. Friendly and very helpfully. Would recommend! Alphonse kept me updated with traffic so even though he arrived late he was extremely reliable. Also absolutely invaluable in manoeuvering the giant cargo through the narrow corridors of my building and into the flat. Highly recommended, will definitely use him again! great guy, knows what he's doing! Really nice bloke and got the job done! Alphonse is an amazing person! Very helpful with my things and made the trip shorter and enjoyable with his conversation. I would recommend over and over again! He was early and very polite and helpful. He was a nice man, but just a bit late - it was a bit embarrassing as it was an eBay pick up and I had to wait in their home. Everything went smoothly. The driver was very helpful and friendly. The driver was brilliant, very nice and extremely helpful with loading and unloading our items. So helpful and polite! Made our move so much easier, couldn't recommend more!Thanks! He was a wonderful lad, highly recommended. Top man, very pleasant and helpful. Alphonse was very helpful he even hoovered my flat ready for next tenants!! Excellent service. Very helpful and assisted me in loading and unloading my many items! Would highly recommend. Also very courteous and considerate. He was a great and friendly driver. The sofas we moved where very heavy and he help us so much. Will definitely contact him for another move. Alfonse was brilliant! So helpful and diligent. He did the job well and put an extra effort in to making my move personal. I will be booking him again! He was great, friendly, respectful, hard-working and Very accommodating! We were running behind with the packing on the day of the move and he moved appointments around to make the slot later. Great value for money. I wouldn't hesitate to recommend. Alhonse was fantastic. 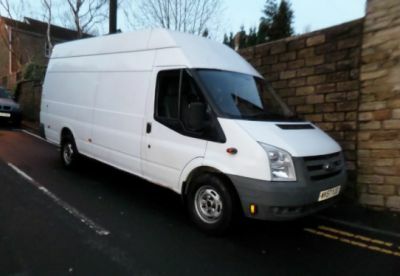 He was spot on time, very kind, helpful, we worked hand in hand loading my things into his van and he drove very carefully with my mirror, pictures in the back. I highly recommend him. Following my initial call to you, the driver was late but telephoned to apologise and from then on was extremely helpful throughout the move. He was a great guy, kind and caring for my belongings and he helped me a lot with my move. He was late but then again he did tell me he was going to be late because of traffic. Would definately use him again and recommend! Friendly and polite. Would recommend him to anyone. First of all, he was a great help! It was very early in the morning and I accidentally left my wrong number so he had to come back again. But he just smiled and said it's ok.
A kind, fun and social man. Alhonse made my move very easy and fast, I highly recommend him! Thank you very much! Alphonze was a bit late because of traffic but he phoned ahead to let us know. He was very helpful. Would book again, amazing service. On time, helpful, friendly, efficient. Would recommend. Alhonse was very friendly and prompt. He was of tremendous help in our move along with the safe drive from the old house to the new. Alphonse was excellent, really hard working and professional. Drove carefully and helped with all the logistics of getting things in / out of the van. Highly recommended ! Really nice guy. Helped us move 2 large sofas, which involved negotiating 2 flights of stairs and a couple of narrow doorways and he made it look easy! Punctual, helpful - would definitely recommend. I found Alfonso to very personable and helpful. The job was completed in good time and I would reccomend using his services as they're good value for money. Really polite, professional and looked after us really well. Very helpful and timely- Thank you for a smooth move! Would definitely recommend Alphonse, he was very friendly, and flexible when traffic made us run over time. Alphonse was great. Friendly and efficient. Not super slick like some I've had but he was available short notice and we finished on time. Very friendly, helpful I will definitely recommend to family and friends. Great driver, would use him again. Very polite and friendly. I didn't have much items but the transport was done in an easy and friendly way. Very smooth move. Big, spacious van and the driver was nice and helpful. Good communication to adjust pick-up time. Safe and considerate driver (I accompanied the load). Very happy with the move. Recommended. Alphonse was very friendly, patient, relaxed and very efficient. A pleasure to move with. Helpful and flexible when our move took far longer than expected, would definitely use again. User warning: comes with complementary sass. Everything ok. But more than 1 hour later. Friendly and helpful driver. Would certainly use him again. The driver was over an hour late and blamed traffic. It was 7pm on a Wednesday evening so rush hour and to be expected. He said he was coming from Kilburn and had expected it to take 40 minutes. I'm sorry but it is impossible to get a van from Kilburn to Plumstead in 40 minutes during rush hour! He did however work out how to get my sofa in a very small door quicker than I could. I'm sure I would have got there eventually. Was a nice guy but unacceptably late. Would give 2.5 stars if I could.